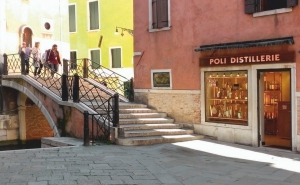 Located in Campiello Feltrina, just a few minutes walk from St. Mark’s Square, along the path leading to the Accademy Bridge, the Venice Grappa Poli show room finds its space. You’ll have the chance to discover our products and explore the most enchanting city in the world with the authentic Spirito Veneto! Trading hours 10 am - 7 pm. Open daily. Admission free. The tasting fee for 3 products of choice is 3,00 € per person; the tasting fee for 5 products of choice and Fregolotta is 5,00 € per person.